Cats' eyes are designed to see in dim light. 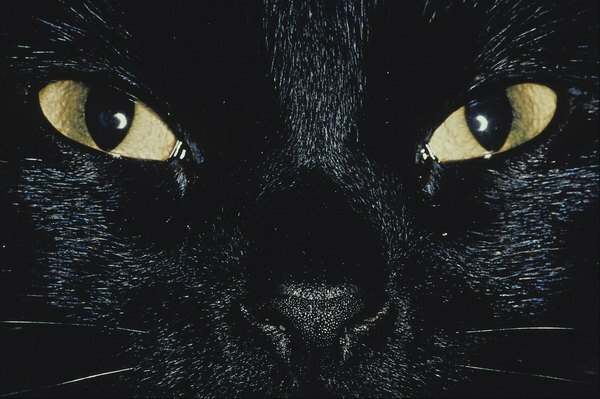 The ancient Egyptians lined their eyes with kohl to imitate the dramatic cat’s eye. The size and shape of feline orbs, however, are not just for looks. They have special features that make them first-class hunters, even though their color vision is not as vivid as that of their human companions. The retina is the part of the eye that receives images. It’s made up of several layers, one of which contains specialized cells called rods and cones. In simple terms, rods provide black and white and low-light vision, and cones support color and daytime vision. Cats have many more rods than cones, to the tune of 25 to 1. Humans have a rod-to-cone ratio of 4 to 1. So, cats can see color, but not as well as humans. The abundance of cones in a cat’s retina means that they can see in dim light. Night vision is six times brighter than that in people. Their pupils also are specialized for letting in light and can get much larger than the human retina. When the cat’s pupil contracts, it becomes a vertical slit. Slit pupils are seen in animals that are active in day and night. The cat’s lens also is much larger than the human lens, also allowing more light. The smaller human lens can focus light over a range of distances, but the cat lens cannot. This is why it is believed cats have trouble focusing well up close. The hunter’s eye gives up fine detail for the ability to see in the dark. He can't tell you what he sees, but a cat does have cones, which are responsible for color vision. Cats have a type of color blindness that some humans have, called deuteranopia. Translation – they can see blue against other colors, but tend to mix up red, green and brown. People with this condition see reds, greens and browns as various shades of gray, but they can see yellows and blues. Maybe this is why your kitty is so interested in that tropical aquarium full of yellow and blue fish! Everything about a cat’s eye is designed to enhance his ability to hunt in low light conditions. Color vision is not as important as brightness, and detecting movement is more important than the ability to see fine detail or to see close up. It is the vision of a hunter active day and night, dusk and dawn, with an amazing ability to gauge distance correctly to catch prey. So, while you’re petting your fur baby, remember that he's not looking through you with those mesmerizing eyes -- you're just out of focus. Pet Place: Do Cats See in Color? What Color is a Tiger Cat?